Can someone tell me what's the latest hit K-drama now? Well, I have been lost from K-drama since I got married due to my busy schedule everyday. I heard Doctors by Park Shin-Hye and Kim Rae-Won is good, and the rating of this drama was good too since the first episode. Can't wait to catch back my K-drama fever. 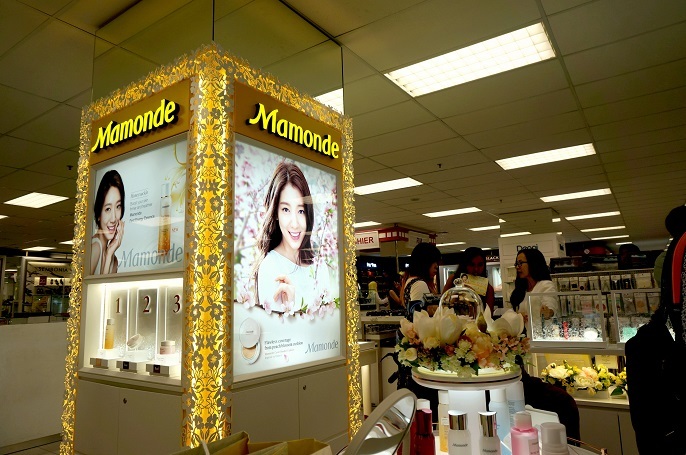 AmorePacific Malaysia's latest cosmetics brand Mamonde has officially been launched in Malaysia now! Big congratulations!!! Being a fans of Korean beauty products, I am so so excited to learn about this new brand! 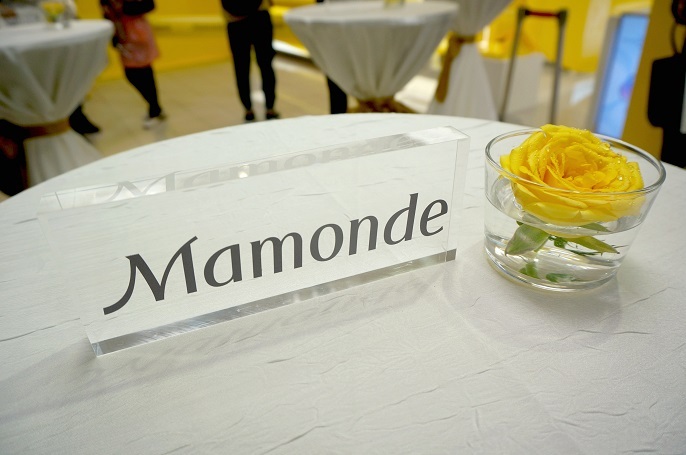 Thanks to AmorePacific for the invitation of the Mamonde first counter grand opening on last Friday. 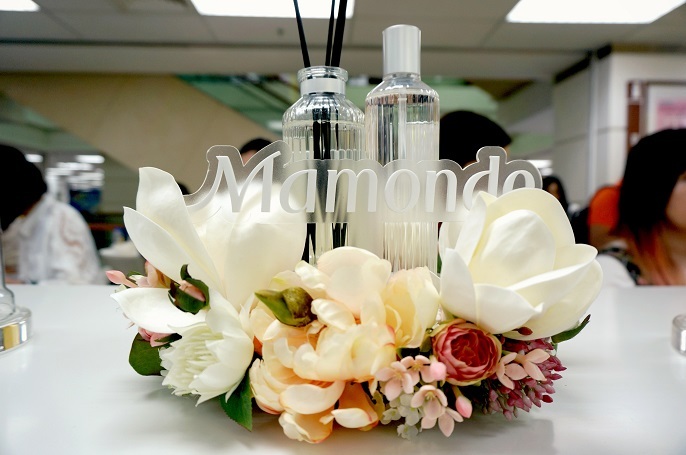 Mamonde is a brand that inspire feminine beauty with flowers. It brings women's beauty into a bloom by instilling the wisdom of nature found in the flowers' vitality into their products. Mamonde aspired to provide skincare solutions for every woman so that they may radiate in blossoming beauty. This new brand has been launched in USA, China, Thailand and now in Malaysia. The honeysuckle has amazing vitalizing properties that maintain skin health. It is an absorbent plant with the ability to absorb nutrients from barren soil to effectively deliver nutrients to vital parts of the plant. The Camellia contains therapeutic properties that help to protect the skin from free radical damage and helps to reduce the signs of aging for youthful-looking skin. 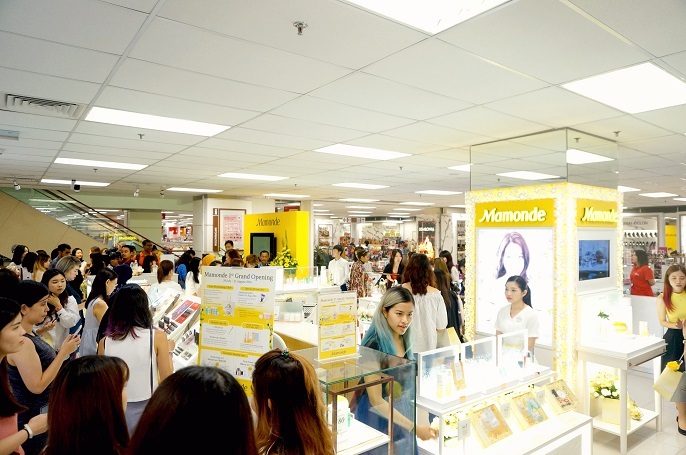 Mamonde has a very eye-catching counter with the most attention-grabbing yellow theme colour. 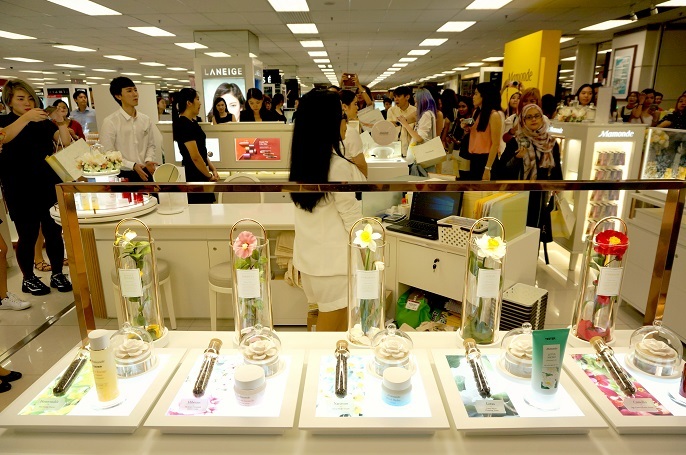 It is located on the first floor at the Aeon 1 Utama, right next to the Laneige counter. The counter has beautifully set up so it is easy to recognize and also catch your attention right at the mall entrance. Since Mamonde is the first skincare brand that uses only flowers as it's key ingredient and coupled with other natural ingredients its formulation, Mamonde has created it's area with floral aromatherapy where customers get to literally stop and smell the flowers to relax the mind with its calming and soothing scents. That's something interesting though, isn't?! 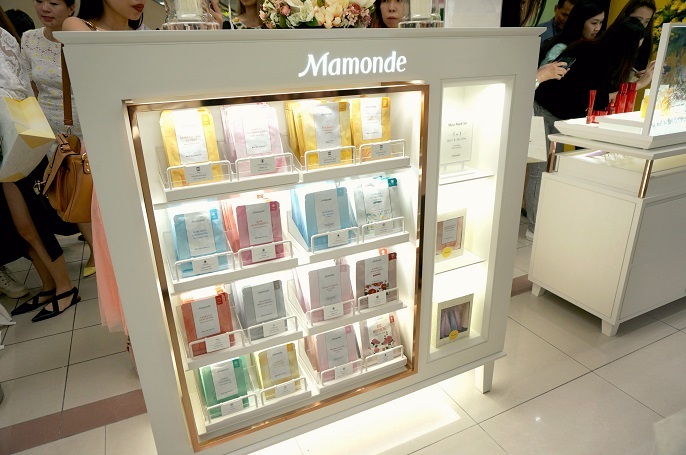 Mamonde's counter carries 140 products from 32 product categories which ranges from skincare, makeup, handcare to makeup for hair. Pricing for Mamonde's products are very affordable as all them are priced from RM6 to RM169. 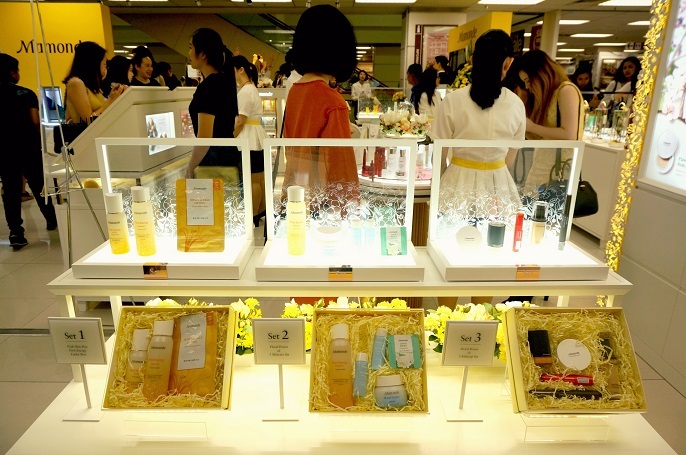 Apart from sales of products, the counter also offers complimentary Flower Touch hand massage with 7 different types of hand creams to choose from. Besides, you can also get free skin consultation from the beauty experts at the counter. 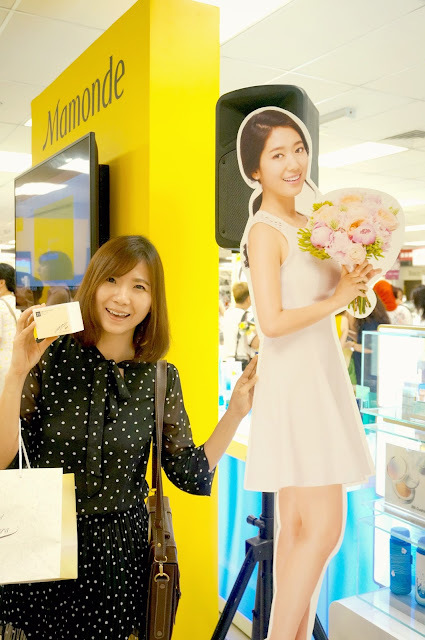 At the event, Mamonde Malaysia also introduced it's brand ambassador Park Shin-Hye, a popular Korean actress with leading roles in hit K-dramas such as The Heirs, Pinocchio, also the latest hit of Doctors. If you are a K-dramas addict like me, I'm sure you know who is Park! Inside the latest drama of Doctors, did you notice the BB cushion that Park Shin-Hye uses? 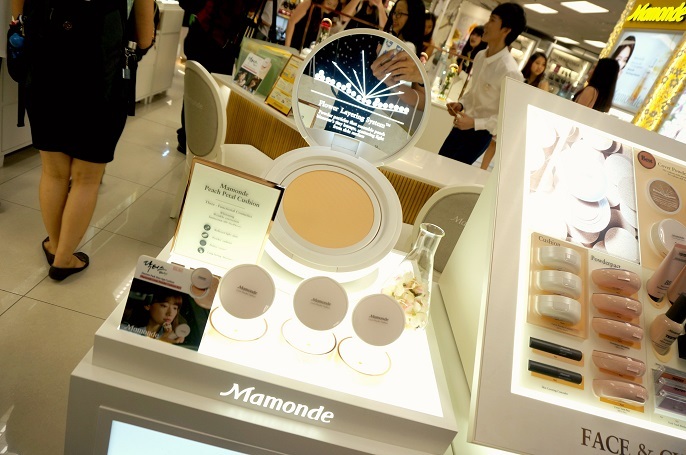 The BB cushion that Park uses inside the drama is actually the Cover Powder Cushion from Mamonde. It is a 3 functional cosmetic which includes whitening, wrinkle correction. and sunscreen with SPF 50+. You can actually call this as Doctor Park Shin-Hye Cushion! As mentioned in the beginning of the post, good news are coming to you now! Fans of Park can purchase the Mamonde Moisture Ceramide Light Cream, Intense Cream and Cover Power Cushion with special autographed limited edition from Park Shin-Hye. The autographed items are limited to 150 pieces per item so fans are advised to purchase now while stocks last. Besides, fans of Park can also stand a chance to meet Park Shin-Hye in person when they purchase the Park Shin-Hye First Energy Lucky Box which includes an Essence and a Serum. 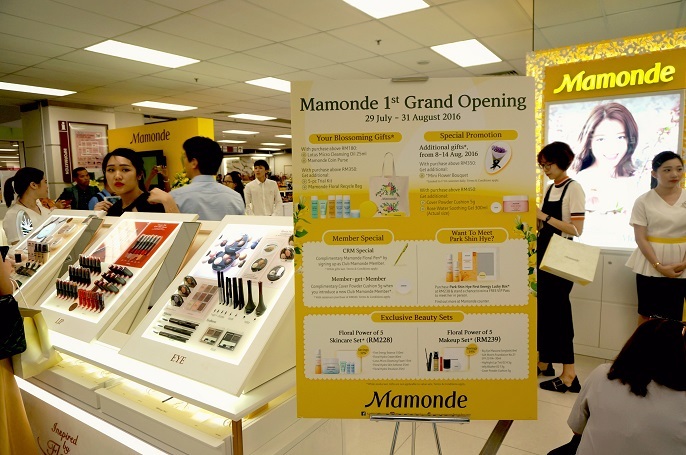 There are a lot more special promotion for Mamonde 1st grand opening! #1 Complimentary 8 piece gift set with every purchase of RM350. #2 Free Mamonde membership with any purchase of Mamonde products. #3 With purchase RM180, free 25ml Lotus Micro Cleansing Oil and a Mamonde Coin Purse. #4 With purchase RM350, free 5-pcs trial kit and Mamonde Floral Recycle Bag. #5 With purcahse RM450, free 5g Cover Powder Cushion and 300ml Rose Water Soothing Gel. #6 Receive complimentary Flower Essence Sheet mask if you were the first 30 customers of the day. #7 Like their FB page to receive a free 25ml First Essence Energy. All the attractive deals and promotions are await in the store and will last till 31st August 2016! 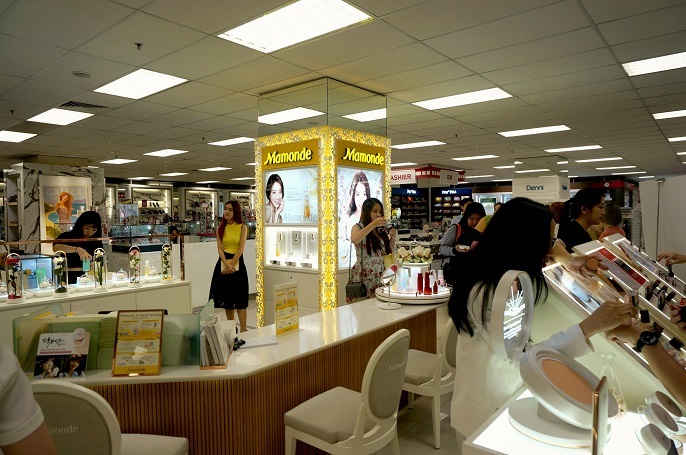 Come visit Mamonde Beauty Counter at Aeon 1 Utama now and enjoy all the exclusive offers! Also, do not missed out the spacious chance to meet the beautiful Park Shin-Hye all the way from Korea!